A lovely day today. We followed the CTC route virtually all day. We left Crewe towards Nantwich and then turned into the lanes to make our way towards Audlem. Sue's knee is continuing to give her problems and she is having to take painkillers to be able to cycle. She bought a knee support in Audlem, which helped stop it jarring on the rough roads. We made our way towards Market Drayton, which is the "Home of Gingerbread". Sue had a gingerbread man but wasn't impressed at all. We got lost on the way out of town and found that Market Drayton is also the home of Muller yoghurts. We eventually found the intended route south past the Golf course, despite a complete lack of signposts. We followed the Tern valley southwards and we could see the Wrekin ahead - the only hill for miles around. The planned route went over the Wrekin, but we diverted west towards Cressage, where we took a minor road towards Much Wenlock. We had to climb a 1 in 6 hill, up Wenlock Edge before dropping into the town. We had a quick look round but there wasn't much to see. We continued up another steep climb along a road running parallel to Wenlock Edge, which we followed all the way to Ludlow. This road gave superb views of Brown Clee Hill on the other side of the valley. 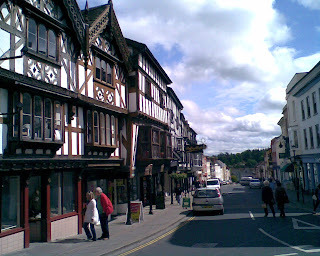 We eventually made it to Ludlow and a much deserved rest day. I hope Sue's knee recovers on the rest day. I like the eating details - plenty of scope for nice eating in Ludlow. Hope it's on track and Sue's not suffering too much.